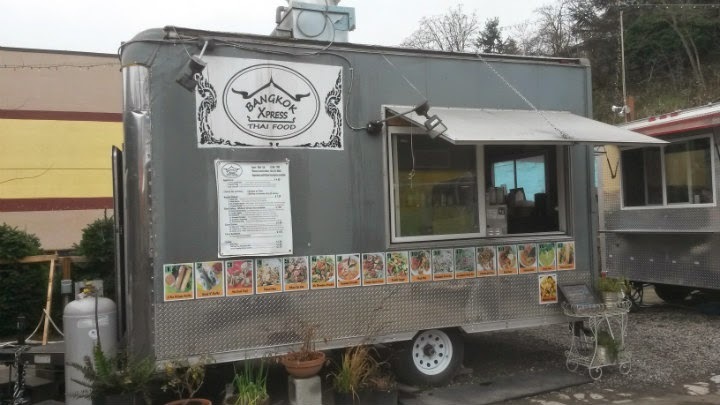 Bangkok Express is located at the Rose City Food Park pod (NE 52nd and Sandy) in Portland, Oregon. Wandering and driving aimlessly around Portland, I stopped at the Rose City Food Park, knowing I hadn't visited in months. Since my last visit, a few carts had left and others had joined, but I did see a few familiar carts -- undoubtedly the mainstays and notable carts this pod had. Bangkok Express was one of those mainstays. The usual Thai options here. The Hollywood's Curry is basically Pad Thai and Drunken Noodles combined with curry. Naturally, everything will be made to order. They had a special going on my visit: Salmon Curry ($7.95). The owners know I love it extra spicy -- mainly because I had given them some ghost pepper powder a few months ago. No ghost powder on my extra spicy meal, but the dried powder used had a nice kick to it. Very good curry, and the salmon still retained its moistness. Just that curry over some rice really hit the spot on a cool day. Thai coffee ($3) is great, but I admit that I enjoy Thai iced coffee over its temperature-hot counterpart.